Locate the proper attachment for this exercise. It will be the same as a single-hand grip or some type of strap that one can secure to the ankle. Secure the attachment to the pulley clip. Position the pulley to a mid-level setting on par with the chest. Grab the attachment/strap and pull it away from the starting position across to the other side of the apparatus noting that there should be a fair amount of tension on the line. Depending on the attachment type, run your foot through the single-hand grip or secure the attachment to your ankle via the strap. Using a hand to stabilize yourself, allow the weight to pull your leg up and away from your body. The leg should not go as far to being parallel with the ground. In a smooth and controlled manner, pull your leg back in and toward the body. It should be slightly in front of your body to prevent the bottom of the foot from hitting the ground. Exhale throughout this motion. Allow the weight to pull your leg back up to the starting position while inhaling. When threading your foot through the single-hand attachment, it should be secured around the shoe, do not thread your foot completely through thus required the metal of the attachment to press directly against the bone. Standing hip adductions should be performed with a light amount of weight and high amount of repetitions. As easy as adduction exercises may seem, caution should be taken while performing them. 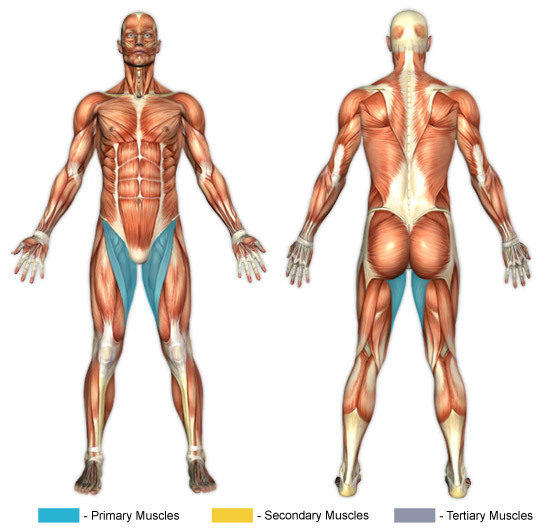 The adductor muscle group is especially prone to injury without proper stretching or a gradual increase in weight used while performing the exercise. Men usually consider adductor exercises to be a women's exercise. The problem is that by men not targeting the adductors, they can expose themselves to potential injury during sports that require quick lateral movements.